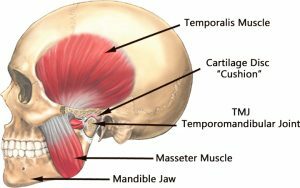 The joint on each side of our face near the ear, that links the lower jaw of the mandible to the temporal bone of skull, is known as the Temporomandibular Joint. These joints are smooth, providing flexibility and thus enabling us to easily talk, chew and yawn. If these joints fail to run smoothly and we start having problem while eating, biting, chewing something and yawning because of any disorder in these joints, then it is called TMJ disorder. TMJs are different from other joints of our body that works to bear the load of the body such as knee joints, hip bones etc. TMJ disorder usually occurs more in women than in men. TMJ specialists and scientists are researching to find out the reason why females are facing this disorder more. Having the combination of hinge and sliding motion, this joint is considered as the one of the most complicated joint of the body. Disorder in the functionality of jaw bone, cheek bone, the inflamed joint and muscles associated with the joint is known as TMJ disorder. If someone has arthritis or jaw injury, he or she has major chances to get TMJ disorder. People who have problem of tooth grinding often face pain and TMJ disorder. The symptoms of TMJ disorder begin without obvious reason. The major symptoms of TMJ disorder have been stacked below through which you can analyse if you are facing such disorder so that you may quickly get it cured by TMJ specialists. If you have started having trigger points i.e., contracted jaw muscles in jaw, head and neck, causing headache, earache or pain in teeth. If you are having difficulty in biting or chewing your meal, then it may be the preliminary sign of TMJ disorder. In many cases, it has been seen that people come across the problem of TMJ disorder because they are not following a scheduled day and having stress as their all way companion. Due to stress, they start clenching their tooth that result in jaw pain or damaged jaw bone. Besides this, if they are regularly having hard and chewy food for which their jaw has to exert extra force, then this also leads to jaw pain and TMJ disorder. So what is suggested is that people should not stress, avoid hard or chewy meal and also avoid taking wide yawning. Excessive intake of chewing gum also leads to TMJ disorder. Thus it should be avoided. There are some special prescription that are suggested by TMJ specialists such as icing jaw, practicing jaw exercises and in severe pain cases, one may take non–steroidal anti–inflammatory medication (NSAIDs) that help a lot in reducing jaw pain. The most common prescription that works best in this treatment is the use of splints if the pain or TMJ disorder is caused by tooth grinding. The treatments mentioned above are temporary and reversible. However, for permanent solutions, TMJ specialists suggest their clients to perform orthodontic treatments through which you can permanently change your bite and other dental tasks. If you are seeking for the best treatment of TMJ in Ahmedabad, then you must visit the dental care center of Dr. Mansi who is highly skilled in respective fields of dental care, treatment and major surgeries. At the dental center of Dr. Mansi, you will be provided the best treatment under the observation of skilled specialists along with the best counseling and dental seminars. The center is equipped with almost all facilities necessary to diagnose dental disorders and apparatus to cure patients.